Hi everybody! My name is Carol and I live in the United States in the state of Pennsylvania (think cold and snowy!). My husband and I just celebrated our 40th wedding anniversary last year and are the proud parents of three sons ages 35, 32, and 29. Our oldest son was married in October so I now have a lovely daughter-in-law who I'm teaching to cross-stitch... Only one of our sons lives nearby, unfortunately. The oldest and his wife live all the way across the country in San Diego, California and my youngest lives about 4 hours away in Washington, D.C. I was a reference librarian for nearly 30 years in a very busy public library and just retired last year. I'm missing my job, but am enjoying the extra time I suddenly have for stitching. When my husband retires in a couple of years, we hope to spend much more of our time traveling and seeing the wonders of the world. I've been stitching since the early 1980s. A fellow librarian stitched on her lunch breaks and I was just fascinated to watch a design appear on empty fabric. I was hooked, although I did take a ten year break from stitching during the years that I was busiest raising my sons. I got back into it in 2003 when I was making a scrapbook for my parents' 50th wedding anniversary. I needed something to put on the front cover of it. I found this pretty heart design and personalized it for them and ever since, I've stitched almost daily! I began my blog, "Stitching Dreams" nine years ago in January 2009. I honestly have to credit my sons for it! When they suggested I start a stitching blog, I had little idea of what a blog even was. But, I began looking at a few of them and figured it would be a good way to keep track of my finishes. Little did I know that my blog would open up a whole new world for me--friendships with stitchers from around the world, gift exchanges, and beautiful inspiration on a daily basis! It has been a wonderful thing... I named my blog "Stitching Dreams" because that very first year, 2009, it was my dream to stitch an ornament sized piece a week for the entire year. And you know what--I did it! My other hobbies include baking, photography, exercise (to work off all of those calories from the baking! ), and reading. I stitch whatever calls my name, although I do tend to stitch seasonally. The only thing I've done is make it a goal to stitch a Christmas ornament each month since I began my blog. My Christmas tree is pretty full after all these years, but I love it. Many stitchers have told me how I've inspired them to stitch an ornament a month, too, which make me so happy. For the most part, I am a one-at-a-time stitcher. I do have a couple of unfinished projects waiting in the wings, but my problem is that if I leave them, I don't want to go back to them! Definitely Prairie Schooler! Especially their Santas--they are such classics... I call Prairie Schooler my "comfort stitching"--the charts use good old DMC and what you see is what you get. There is no wrangling with overdyeds that look nothing like the front of the chart and it is easy, uncomplicated, meditative stitching. I'm most proud of not just one piece, but of the 2012 "Year of the Bowl Challenge" that I did. Each month I would stitch five or six little pillows to represent that month (Snowmen in January, Love in February, Thanksgiving in November, etc.). It was a lot of work, but so much fun and I think that is the year that many of my blog readers first discovered "Stitching Dreams." I can't think of a true disaster--my iron has had a run in with ric-rac a couple of times leaving a melted mess on my stitching, but I've been able to cover it up with a bow or button. I am great about finishing my smalls as I stitch them--larger pieces, not so much! I have a large portfolio filled with unfinished larger things that really should be framed. I haven't found a good framer near me, which is part of the problem. I will frame smaller things myself, but I should really push myself to get those finished things out, framed, and hanging on my walls! I would say "Simple Life" most represents me... I am very content with the simple things in life--a newly built nest filled with Robin's-egg blue eggs, a fresh snowfall, the laughter of my sons, a kind word given or received. I can never remember jokes so it will have to be a secret--sort of (some of you know this!). In 1996 we spent a year remodeling our home and in 1997 the magazine Better Homes and Gardens honored us with the Grand Prize in their annual home remodeling contest. It was featured in the February 1998 issue of the magazine--exciting, but a bit hard for me as I'm naturally shy and quiet. It was most interesting to see the photographers and room designers at work, though!! 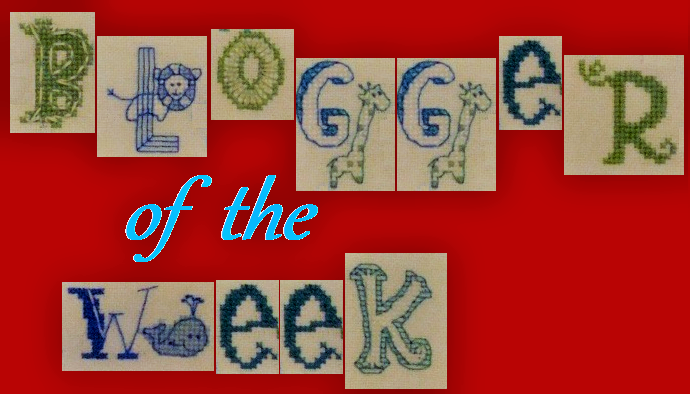 Thank you all for reading my little interview--and a special thanks to Jo for the "Blogger Of the Week" feature! It is so much fun finding new stitching blogs. Happy Stitching, everyone! Carol I loved reading this post all about you and your blog. YOU were my inspiration to begin my blog! Keep it up Carol! We all love you!! Thank you so much, Vickie--I'm really happy to read that my blog inspired you to start your own wonderful blog... You are so sweet! Carol, what a wonderful post - I so loved reading more about you and your life and your seeing so many gorgeous examples of your beautiful stitching and finishing. Thanks, Kaye! You probably didn't learn much new about me after having read my blog for so many years, but I truly appreciate your friendship and your comments! So great to see you here as well and to read your answers to Jo's questions. The pictures of your stitching are all fantastic and yes, you also motivated me in the past to do some more finishing. And now you are also entering the world of the hexies, lol. So great to see a post here. A lovely post with so many wonderful little ornaments and cushions. I like your blog and you inspire me, to make little cushion. So nice to see you featured here, Carol! I knew you stitched a lot of ornaments (and get them finished! ), but completing your one a week challenge is an incredible accomplishment! You certainly do inspire us ... I hope to get back to stitching an ornie each month. I started following your blog in the year of bowl smells. It's so nice to know your story. I too live in Pennsylvania. Hello neighbor! Hi Suzanne--So nice to meet you and hear that you've been enjoying my blog for a few years. Where in Pennsylvania do you live? Carol, it's lovely to see you featured here and to learn some more about you. I enjoy following your blog and Instagram account. Thank you, Christine--I always enjoy seeing what you've been up to on your blog posts! Aww... thank you, Preeti--that is so kind of you! I always enjoy seeing what you've been creating, too! Very pleased to learn more about you Carol! Your stitching is beautiful and your Christmas tree, all I can say is WOW! Looking forward to seeing more beautiful stitching on your blog. What a beautiful collection; I love your bowl of infinite designs! All of them are so neatly finished and they must be a real joy to bring out each season/holiday. The BH&G prize is really interesting! I would be torn also; I would dislike the "attention" but would be so curious about all they are doing. Thank you so much! I really did have fun doing my "Bowl A Month" in 2012! I need to go back and add to a few of the bowls (like March and May) that I don't have as much stitched for. Lovely to read about you Carol and to see some of your older ornaments together! Your home always looks beautiful, it must be a feast for a stitcher's eyes with all your ornaments in bowls. There are always so many gorgeous things to see on your blog. Lovely to see some of your older projects Carol. How exciting to be in the Better Homes and Garden magazine. Thanks so much, Julie! Yes, the magazine feature was exciting, but a bit out of my comfort zone. After it appeared, we got calls from the newspaper and even a television station wanting interviews. I agreed to the newspaper, but could never go on camera :) And then there was the air-conditioning company who wanted me to do a commercial for them--um... NO!! Anyway--my 15 minutes of fame so to speak! I've enjoyed Carol's blog for a long time now. I'm trying to make pieces like yours for my seasonal shelf area. Your finishing is just amazing!! What a wonderful post....it's so nice to get to know you! What beautiful stitching and finishing. Hi Carol, nice to meet you! You have some lovely stitching...and a ton of ornaments! I am quite impressed by your challenges - one ornament a week, five pillows a month, that takes some serious dedication. Carol: Its such a pleasure to follow you and to learn some things about you. Thanks so much, Catherine! I always enjoy visiting your blog and seeing your lovely stitching AND finishing--it's always a treat! It was so much fun reading this. I learned new things. I would love to see the magazine. You need to share it with us! I just love Carol's blog and her stitching is so pretty! Thanks for sharing this interview! Thanks so much, Arlene--I always enjoy my visits to your blog, too. Am amazed at how often you post--really impressive! Wow love your write up and a chance to see all your lovely stitching again . I always enjoy reading Carol's blog. Lots of eye candy (lol) stitching and she creates a warm atmosphere with writing about stitching and life.